Using Okta allows you to set up a direct link from your Okta dashboard to ProdPad. This will allow your users to log in to ProdPad without having to enter a password in ProdPad. 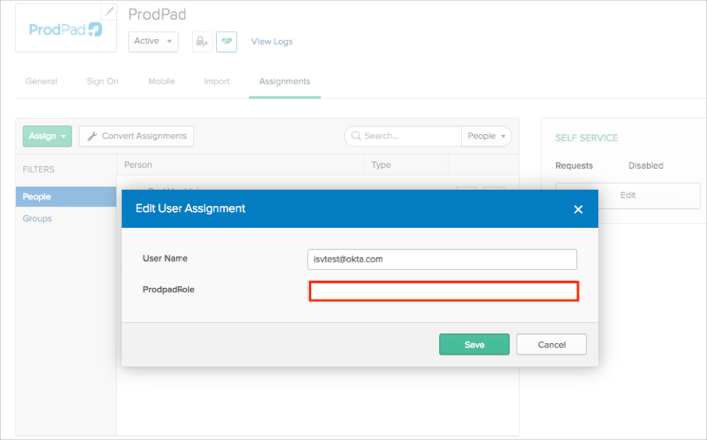 Just-in-time provisioning: if a user has never logged into ProdPad before and they click on the ProdPad app in the Okta dashboard, a role will be created for them in your account. The role will have a reviewer type unless SCIM is set up. For Performance and Enterprise plan customers, please contact us if you wish to have your users auto-provisioned and fully managed in Okta. The process starts with creating an application within Okta and then creating a corresponding integration in ProdPad. Go to the Applications tab in the Admin view of Okta. Click on the "Add application" button and then the "Create New App" button. In the modal select Web and SAML and click on create. Add "ProdPad" as the name and upload the logo (available at the bottom of the page) and then hit next. On the next page enter the URL https://api.prodpad.com/api/v2/sso/saml/acs into the Single sign on URL field. Select the option "EmailAddress" from the Name ID format select box. Select the option "Email" from the Application username select box. In the attributes section add an attribute "User.FirstName" and set the value to "user.firstName"
Add another attribute "User.LastName" and set the value to "user.lastName"
Click the "View setup instructions" option. Almost there - now let's set things up in ProdPad! Copy Into the field "Sign-In URL" in ProdPad, the URL from the field "Identity Provider Issuer" from the Okta setup instructions page. Copy into the field "ACS Http Endpoint" in ProdPad, the URL in the field "Identity Provider Single Sign-On URL" from the Okta setup instructions page. Leave the "Logout URL" field blank. Paste the text of X.509 certificate into the X.509 field. 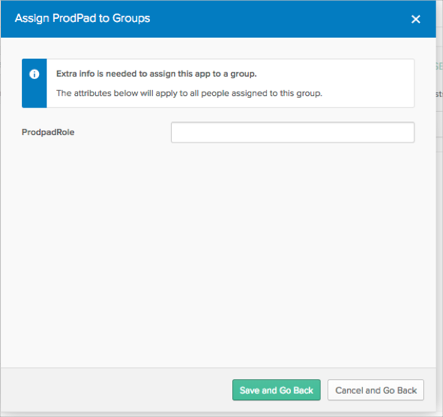 Now, when you assign users to the ProdPad app, you can specify the attribute ProdpadRole for a user.The value needs to be either reviewer, editor, or admin (lower case). If the role is not specified a user will log into as a Reviewer. The domain you enter into the form must match the email domain that you are using for your own role in ProdPad. If it doesn’t match it will error.